The top was made on a base of a bridal bustier, it was sleek, gave me support and a good shape, so I built off of that. I slightly altered what the front of her dress looked like, but other than that, the top was the easy part! The wings were a foam base covered in black fabric and each feather was hand cut from heat foramable Sintra plastic. A hundreds feathers or more hand cut, heat formed, shaped, sanded and painted over and over again, those wings nearly killed me! The hung by long metal hooks that attached to a belt I wore tight to my body under the bodice. My gladiator skirt was drafted by me and made in PVC black fabric, and the black tutu underneath was also something I custom made for this outfit. All of the leg armor was made from Sintra, shaped, heat formed, filled in with Bondo, covered with primer and painted/lacquered many times. 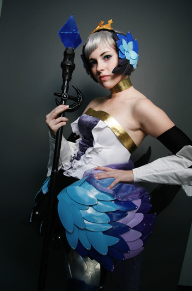 The wings on my knees were a craftfoam piece and so was the entirety on my head dress and parts of the staff. The staff lit up with LED’s and I used clear plastic painted with stained glass paint for a deep blue color. This costume is a beast! It was so hard to get around in, and was quite painful after an hour or wear! This outfit was also a featured costume in the published book “Cosplay in America” by Ejen Chuang. It’s a wonderful publication and can be found here on Amazon: http://www.amazon.com/Cosplay-America-Ejen-Chuang/dp/0615349064 The gallery below includes some pictures that the author took of the costume!